Do you have a chronic condition, an injury, pains or aches which have been bothering you for weeks, months or years? Do you get relief after a massage, but then a few days later it starts all over again? Do you want to relax and experience the feel good magic that happens when you receive a massage? Or do you want to feel more comfortable in your body? To help with this, I’m going to walk you through some scenarios. I recently hurt my shoulder. I think it was after lifting weights in the gym. Whatever problem or injury I have, I will have a Bowen treatment straight away. But this time, the only available Bowen appointment was two weeks away! I needed to do something as soon as possible as I was in discomfort. I had no choice but to have a massage to get some relief. I was desperate! For two days in a row, I got my husband to massage the area where I had the pain. I asked him to apply strong pressure. He’s not a massage therapist but he’s learnt from me over the years and I tell him exactly what I want, where and how. :) The massage was painful but it worked - the shoulder pain went within two days. I think I would have had the same result with one Bowen treatment without going through so much pain. But it made me think. A lot of people have a regular massage so let’s take the example of someone who suffers from tension around the neck and shoulders. A massage gives them relief for few days but then they often feel the same tension again. Many go on to have a weekly massage (if they can afford it) and they are free of discomfort for two or three days of that week. It’s an ongoing process, with no changes in their body and a general acceptance that receiving a massage is what they need even though there is no lasting improvement. I have very often heard that line, “I’ll rest and it will go”, after someone hurts their knee, ankle, shoulder or elbow, for example. Let’s explore these examples in more details. Why did having a massage work for me in this case? In my opinion, the fact that this injury was not linked to postural problems or was not the result of any other injuries had a huge impact on the success of the massage. Timing is also very important. By having the massage very early on, the body did not have to make any compromises to be able to function. Also, the massage brings a fresh supply of blood to the affected area and helps start the repair process. First of all, chronic pain is often defined as any pain lasting more than 12 weeks. It persists often for months or even longer. The fact that the person has had this pain or tension for a while means that the body had to make some changes to be able to move with maybe less pain. Having a massage will not help in this instance as the body has had to make compromises and, as a result, will be out of alignment. A massage could help release tension and give temporary relief but will not realign or create the changes that the body needs. Bowen Therapy, on the other hand, would help re-balance or re-align the body and, as a result, you would likely feel a reduction in pain. Sometimes it can take few sessions before you are completely free of pain as it all depends on what your body is going to do. Your body knows exactly what it needs to do and it will prioritise on what is best for you at that moment. For example, if you have knee pain, it might be that your pelvis is out of balance and needs to be re-adjusted to remove the pressure from the knee which created the pain. Why do I choose to have Bowen Therapy in most situations? With Bowen therapy, we don’t focus on an injury or condition. We need to know the health history of our clients to plan the treatment and try to understand what is going on, especially for an ongoing matter. But then, we look at the big picture; we look at the person as a whole, as anything that happens to us can be the result of past issues. Since I started having Bowen treatments three years ago, my body has become more aligned and I very rarely now have an injury. I used to have daily headaches, tension around my neck and shoulders and a nagging pain in my lower back for years. Massage only helped me temporarily to feel better during the treatment and very shortly after. It also relaxed me but it’s only when I started having regular Bowen treatments that I could see and feel changes in my body. I no longer have these nagging aches, pains and tension that I used to have. I still like having a massage as a treat as it feels so good and I love it. BUT, if I have a problem, I will choose to have a Bowen treatment as I know that I will have results. A lot of people think that if they have an injury and do nothing, meaning no exercise, the injury will go away. It’s true that in many instances the pain will disappear and make us feel that we are ok now. So we go back to our exercise routine! So what exactly happens when we have an injury and then do nothing? The body will have to make some adjustments in order to function. It basically changes your posture. 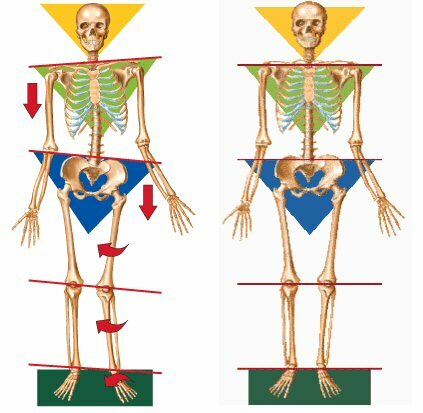 It can be anything from the way you stand, move or even tilt your pelvis forward slightly; turn your foot or feet inwards or outwards; move your head forwards… you get the picture? - there are hundreds of possibilities! You have to be aware that your body will do anything to help you, but in the long run these postural changes will create other problems as they are not natural positions for the body and as I said earlier they are a temporary measure that the body takes in order to make us feel at ease - ideally until we do something about it. The body has a lot of survival mechanisms which will come into place when needed. If you have an injury, even a slight muscular pain and you are uncomfortable when moving, do something about it, as it won’t go away even if you rest. The quicker you act, the quicker the recovery. If you don’t, at some point in few months or even years, you might develop another problem which you’ll think is an isolated problem but in most cases, it’s linked to an old injury. Some therapies that manipulate the body by cracking, twisting or rubbing soft tissue, work but then the body relies on them and loses its ability to heal itself. Bowen, on the other hand, does not manipulate. The practitioner whilst performing gentle moves gives information to the body and the body does the work. In a way, it gives the body its power back, lets the body decide what it needs to do to get better. What is very important is to find the therapy which works for you and is going to help you maintain good health. Everything in this blog is my opinion based on my personal experience and years of practising bodywork. I've beem a Massage Therapist for more than 20 years where during that time I went on a journey where I studied and developped my passion for health in general, well being and the human body.